I had to show you guys this awesome-ness. Check out the stopsignflower to visit the brilliance of this idea. Basically a guy's daughter got a knitting kit, he had to learn how to teach her how to do it. 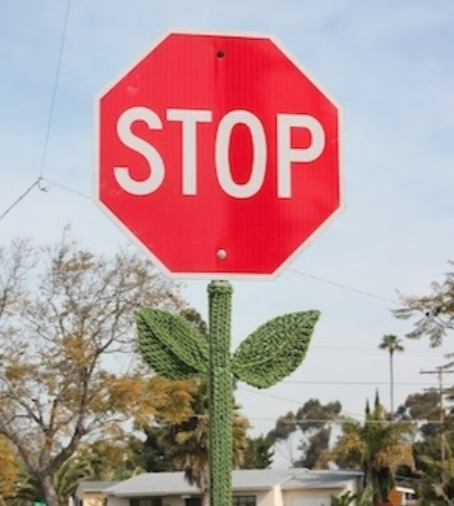 He thought of knitting these "stop sign flowers" and put them up around San Diego. #1. I wish I made shoes because no one seems to be able to make cute shoes that are comfortable. Bring on the failed attempt to buy a pair of sandals- if they were cute they hurt my feet, if they were comfortable, they were ugly as sin. #2. I love them smell of real roses, but I don't like "fake" rose scents. #3. I played the Hammered Dulcimer, when I was little- if you don't know what it is google it. I know it's kinda weird. But I like being weird. what are you up to this weekend!?!? PS. Did you see my yacht yet!?! 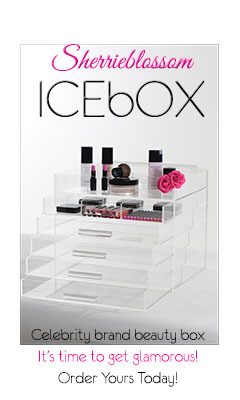 ha ha ha ha ha ha CLICK HERE TO CHECK IT OUT- it's awesome! Your the sweetest person in the world! I make custom suits as well and would love to make a kandee suit!!! Have a great day! Kandee I just have to say I watch ur videos and read ur blogs everyday and u always make very happy.Whenever I get free time ur the first thing i want to read about or watch. U are the most positive inspiring person ever!!! I can't wait to see what u come up with next.